I am a huge fan of Samantha Young books, I know every time she has a new book out it will be good. Fight or Flight is no exception to this rule. Right from the first paragraph the characters and story draw you in and won’t let go until you’ve exhausted yourself trying to finish the book in one sitting. On Dublin Street is still my favourite Samantha Young book but Fight or Flight has moved up to a very close second. 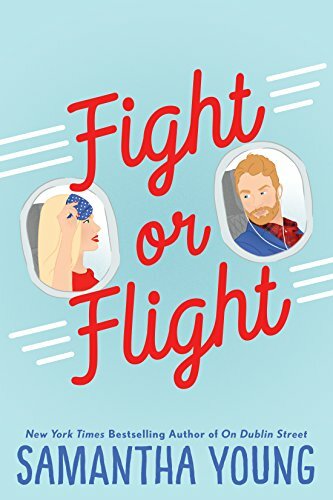 Fight or Flight is an enemies to lovers romance starring Ava Breevort, a classy Boston interior designer, and Caleb Scott, a somewhat rude and arrogant tech CFO from Scotland. Ava and Caleb run into each other (literally) several times at the airport while trying to catch a flight to Boston. They start off on the wrong foot, and stay there for the majority of their initial interactions with an underlying physical attraction. Another chance encounter at a restaurant lead them to address the sexual tension between them for one night – which both quickly realized would not be enough to get each other out of their system. As Caleb is stuck in Boston for the immediate future, they strike a deal to have a friends with benefits type of relationship. Neither of them want to be in a serious, committed relationship and so this works out for both of them. As you can imagine, things don’t really go as planned and as they get to know each other more they each start to develop feelings which leads to a lot of confusion and jealousy. I really liked Ava as the protagonist, she had a tough past but overcame it to build a great career for herself. She is also just a very nice person who cares about her friends and family, I loved her relationship with her best friend Harper and hope to see a Harper book out next. Ava was a great example of a woman making it on her own while still remaining true to her values and morals. I have mixed feelings about Caleb, I’m not 100% sure he was deserving of Ava. He did have a bad relationship in his past that has made him wary of new relationships, but I felt that he really let his past affect the way he interacted with Ava. Caleb, and his brother, would often focus on Ava’s looks and even once they got to know her better still hold her polished appearance against her. I can understand judging someone by their looks initially, but this really needs to stop once you get to know a person. I just think that Caleb was a bit of a grump for a tad too long, and he only really wanted Ava once he clued into the fact that she would be moving on without him. I knew he really did love her because of the full story, but if I had just read the ending it would almost seem as if he just wanted Ava because he didn’t want anyone else to have her. With all that being said, this was a really good read and I couldn’t put the book down. The story line was great and the characters had a lot of chemistry. I always appreciate how much Samantha Young develops her characters with a full backstory. I highly recommend this book for everyone who loves a good enemies-to-lovers book.